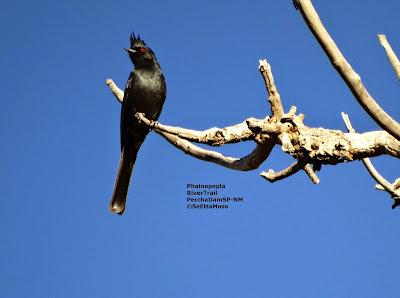 Phainopeplas are iconic southwest birds but most migrate to Mexico for the winter. So I was delighted to spot this male when I took the trail from the Percha Dam State Park campground. He was about a quarter mile south of the campground and 50 or so feet up a tree. He called a couple of times and at one point I heard another Phainopepla call but did not see the second bird. I stopped by Bosque del Apache NWR on my way south. As I drove one of the Refuge roads I saw 2 cranes flying close and saw that one was the unusual 'white' crane that the Refuge has identified as a leucistic Sandhill Crane. 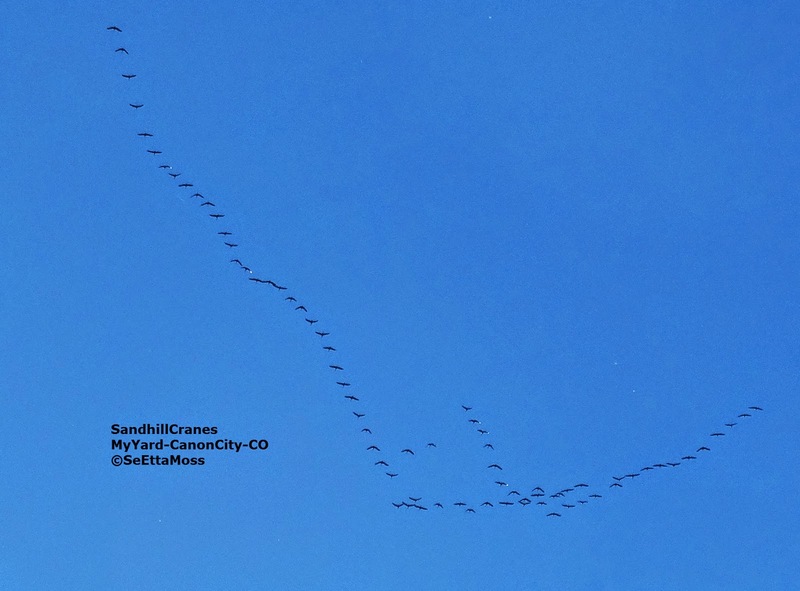 There had been concern by crane fans that it would be rejected by the other cranes and it certainly had been by itself when I and others observed it over the past week. 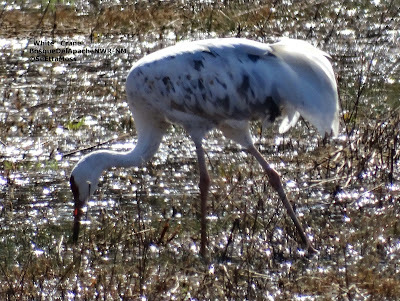 As can be seen by the photos below the 'white' crane and it's new friend stayed together after landing and proceeded to feed together for the next 20 min while I birded nearby. 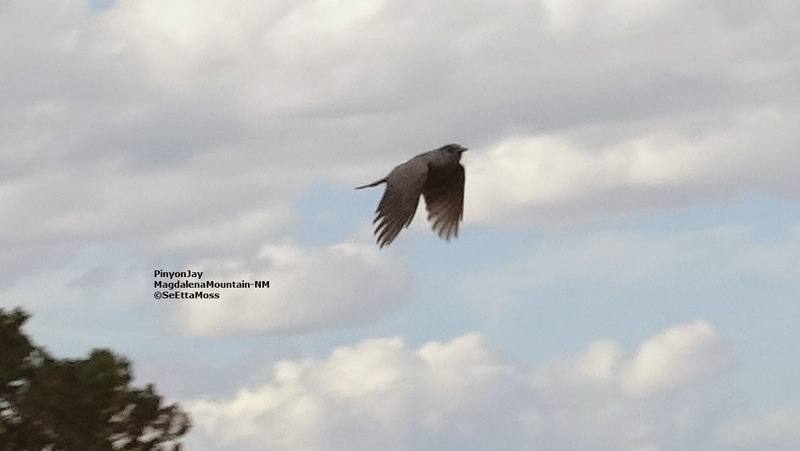 Yesterday I birded around the Magdalena Mountains just west of Socorro,NM. Birding was slow in famous Water Canyon in which a lot of rain fell for the prior two days. I was delighted to find this very nice flock of 150-200 Pinyon Jays on the lower slope leading up to Jordan Canyon. 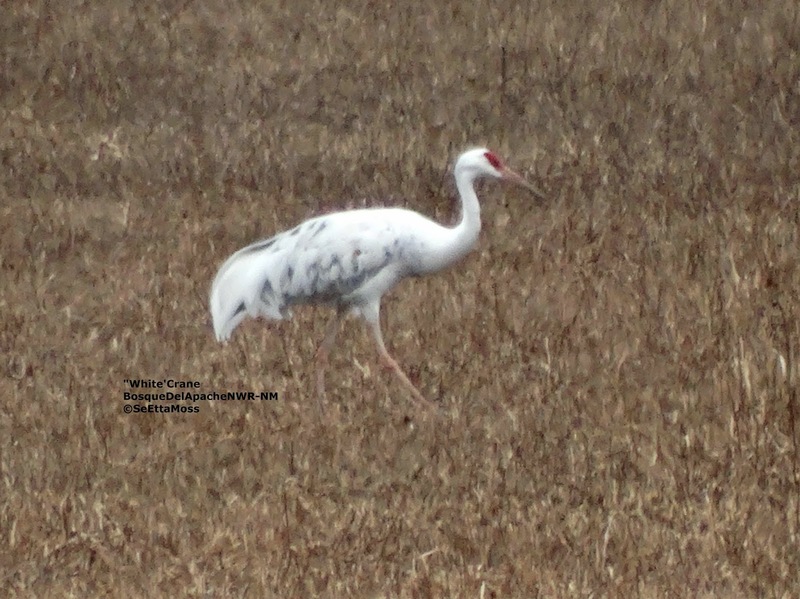 This 'white' crane showed up last week at the Bosque del Apache National Wildlife Refuge. It is clearly not an albino as it does have color not only in feathers but in eyes and in it's bill. The Refuge states it is a leucistic bird. Though this 'white' cranes mostly whitish feathering fits with leucism I don't know why it's bill is so lightly colored. I saw this unusual crane several times this past week. It has been in the company of Sandhill Cranes though I have not seen it interact with any.